During bloom season ( month of May), our display gardens are open daily 9:00 a.m. to 6:00 p.m., rain or shine. Click here for directions to the Display Gardens. Our 10-acre display gardens contains over 500 named varieties and countless companion plants. Bring home fresh cut Iris blooms or order rhizomes for your friends and yourself. 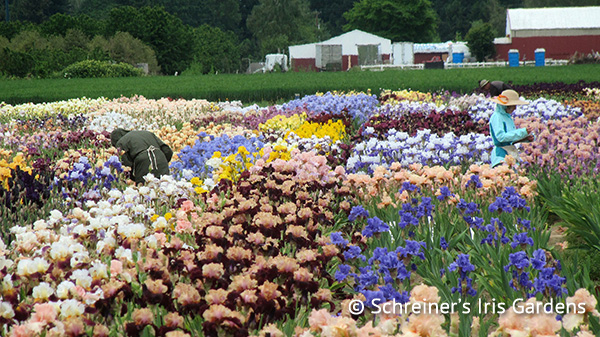 Treat yourself to a day at Schreiner's Iris Gardens. Read these visitor reviews on Trip Advisor. You'll get the picture! 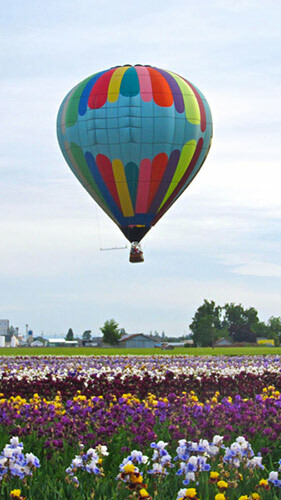 Join the bloom season celebration in May! Enjoy a family tradition among the iris! Family friendly, great picnic location. Dogs welcome on leash. May 25, 26 & 27: Artist Fair 10:00 a.m. to 6:00 p.m.